I was in a village called Kasur, near Lahore. 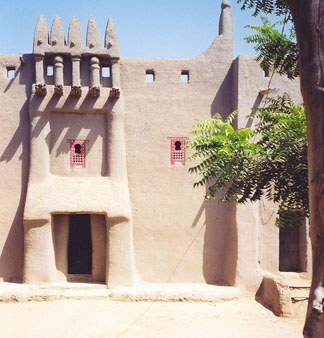 They had some flat roofed earth buildings which were just fascinating. 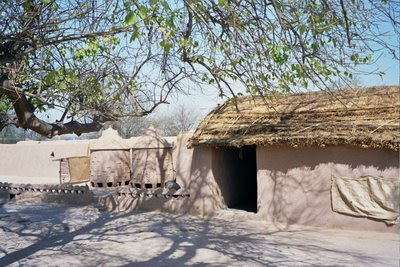 The mud plaster, craftsmenship, the roof were exquisite. But unfortunately they are being replaced by modern construction material. I asked an elderly person about his perception on the mud building and he said, there is a “firman” that when all the mud buildings are replaced, then the prophet will come back again. Is that a common perception? But anyways its a great initiative. 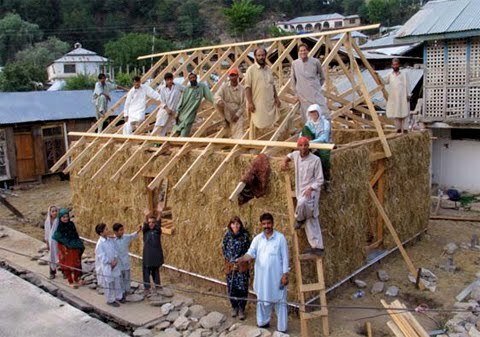 We are doing similar stuff in Nepal, please check http://www.abari.org by Nirpal. The Muslims of Gaza are now re-building their lives using mud bricks! 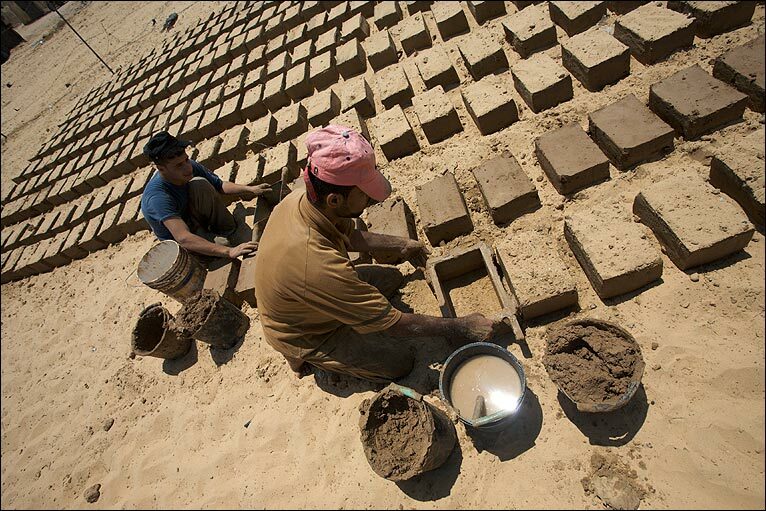 A Palestinian had travelled to South Asia and saw how the people lived in mud dwellings, and used the idea in Gaza. Now it is recieving funding and help, and the people are building their own mud brick homes. 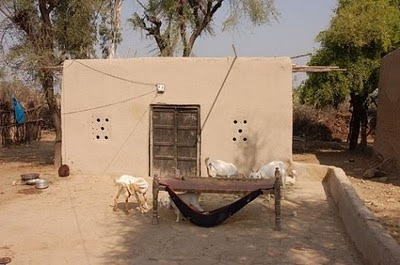 Thatta Ghulamka Dheroka, commonly called Dolls Village, has special attraction for all those who are interested in architecture and those who are interested in traditional housing. Thanks to the long standing experiences of the TTTC with simple technology and mud housing, combined with the cooperation with SPARC in Lahore that the common perception about local and environment friendly materials has undergone a fundamental change. Through the initiative IEC@BNU and through the FPAC Foundation, which publishes the quarterly magazine GREEN MAG, for the first time architecture students and professors have visited the project intentionally in order to acquaint themselves with the traditional mud architecture and how it exists in Thatta Ghulamka Dheroka. On their way to the village, between Lahore and Okara, the group also visited a Bio-Gas-Installation facility. Here are some images of the trip. University of Southern California, Los Angeles is seeking students to join their doctoral program in architectural technology in Fall 2010 in their globally diverse program. The University is looking for students interested in all aspects of the building envelope: sustainability, daylighting, structures, computing, BIM, energy performance, power generation, glare, intelligent skins, etc. We have substantial scholarships, an outstanding new facility, and extraordinary faculty. This year we hired three new tenure track faculty members in architectural technology. This article again refers to “housing”, the architectural, economical and philosophical aspects of which have already been discussed. In this article we will discuss the scientific and technological aspect (Architecture, Urban & Regional Planning) which however are not totally independent of other areas of the culture. As clear-cut diagrams and illustrations mean more than words for the engineer and scientist, the accompanying text may be considered a literary explanation of the important inter-relationship. A very simple text for the illustrations would probably not appropriately describe the total picture. In the following we will discuss the very basic questions of "housing" and describe the range of possibilities between the Rural Entity and the Fully-Autonomous entities, in the middle of which is the most widely practiced concept of Urban entity. Seen from a total perspective, the Urban entity is the subject as well as the object, because the actors in this system are not able to act freely as they are bound by the compulsions and dictations of economy. The actors are forced to act in the way as they do because the system does not allow any other alternative. And: the actors in the system don’t even realize that they are not acting of their own but actually are being acted upon !